One thing that intrigues me about the world of pies is how varied they can be and I don't just mean in terms of filling. There can be enormous variation in price too. A value, individual sized pie can set you back as little as 50p but then an individual premium pie can cost the best part of £4. How can there be such a disparity in cost? In reality a value pie is often half the size and would often have quite an air gap inside the pastry so you are getting much less pie for your money. 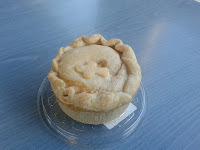 There will also tend to be a lot of sauce in a value pie to make up for lack of meat which clearly impacts on the taste. One thing is for certain, not all pies are created equal. But does paying 8 times as much give you a pie that is 8 times better? Certainly not, there is only so much you can do to improve what is an already fine product, spending more might get something a bit better but it will inevitably follow the law of diminishing returns. In our pursuit of pie perfection we must try them all, cheap and expensive, in order to tell you which pies are good enough for you to spend your hard earned cash on. Today I have visited the top of the food chain, Selfridges Foodhall on Oxford Street to see if they really are worth the price tag. 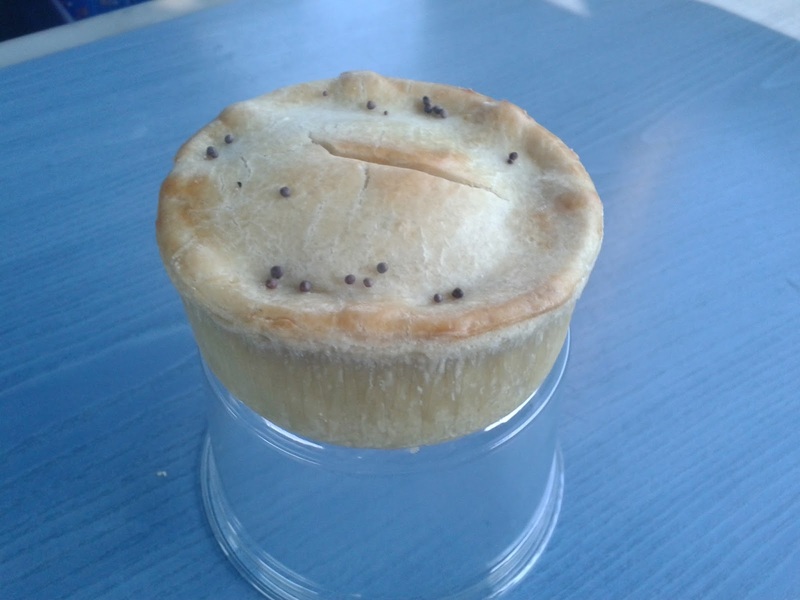 We reviewed one of their pies before and found that it certainly offered an experience you couldn't find elsewhere due to a unique flavour. One pie review is really just the tip of the iceburg of what Selfridges have to offer. A pie counter greets you with ample selection and someone on hand to box up whatever pie takes your fancy. There are a few different pie makers represented so quite a variety of types of pie. I like that the pie counter allows you to see exactly what Condition the pies are in before buying. However I was disappointed that the serving lady could not tell me more about where the pies were made. I decided to get two pies which promised to be quite different from the usual fare and from each other. I opted for a Spicy Cauliflower, Spinach & Lentil Pie and a Applewood Smoked Bacon & Egg. 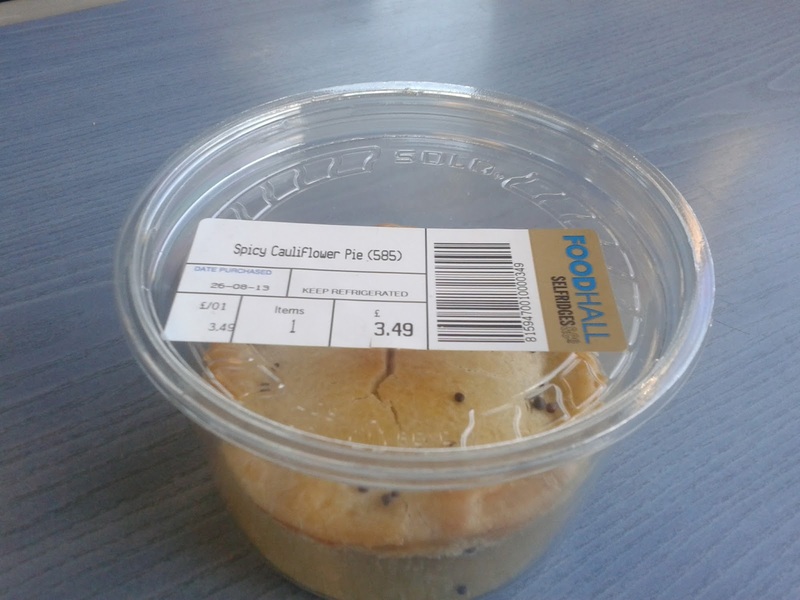 I hadn't quite realised how much a premium pie was going to set me back. There didn't seem to be any pies below £3.49 and in total, two pies cost me £7.49 which shows inflation has hit since we last visited. These pies certainly had to be very good in order to justify their price tags. First up, the Spicy Cauliflower. This was a text book premium pie. Unusual flavour, soft gooey pastry, a nice height to ensure good Capacity and filled to the brim with Content. It looked a fantastic colour and was even decorated with small seeds. This tasted like a proper curry from a restaurant except it was in a pie. 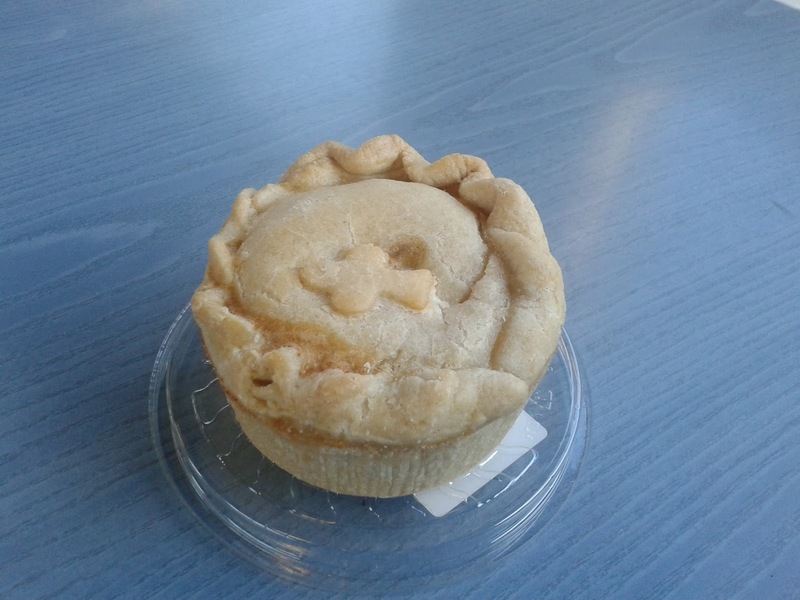 Normally curry pies have a generic chip shop curry sauce taste and no depth of flavour. However this pie was full of flavour from the variety of different spices used. 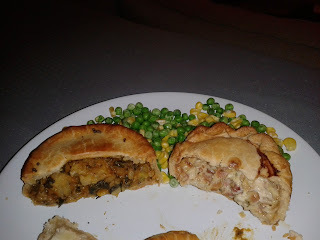 The curry flavour complemented the pastry well. The pastry seemed slightly adapted to taste more Indian, I thought it might contain gram flour. The filling was very soft so that it require almost not Chewing at all. This meant it slipped down a treat but perhaps lacked the satifying texture of a meat pie. Despite this minor critiscism I would go as far as to say it is the best curry pie I have ever had. At £3.49 this was expensive, but worth buying. Secondly the Applewood Smoked Bacon and Egg. 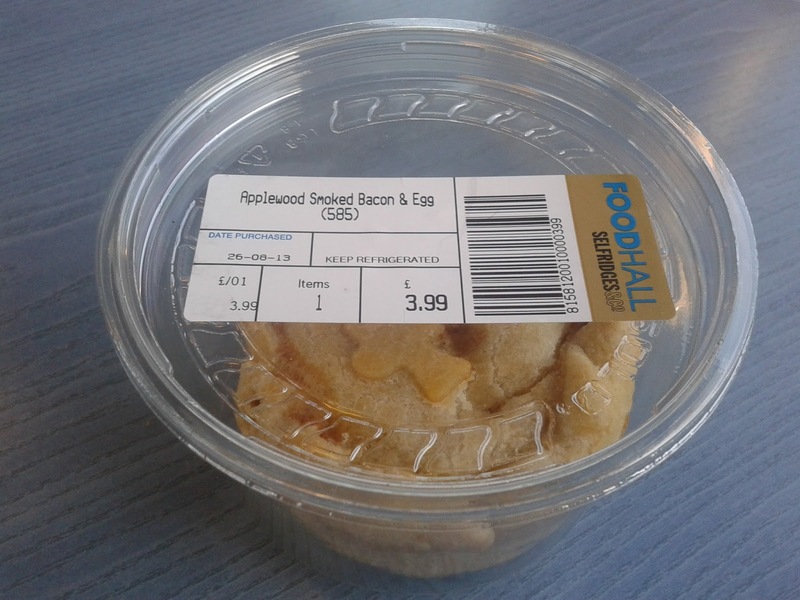 I didn't really understand what applewood smoked meant but it is does what it says on the tin, bacon which is smoked by burning wood from apple trees. As far as I can tell this adds pretty much nothing to the quality of the bacon and is just a marketing gimmick. That pretty much sums this pie up. It looked great, cooked well, was packed with content but ultimately it just didn't taste good enough to me to justify costing £3.99. I would go as far as to say this was a below average pie. I felt it was fairly dry pastry, which wasn't helped by a complete lack of sauce. Instead egg was used to hold the chunks of bacon together. True, the smoked bacon gave it a lovely strong flavour but because of the dryness I soon got fed up of eating it. It was a bit like eating a quiche that someone had put a pastry lid on. Not what I was expecting when paying this price. 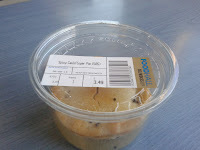 I have since found out that this is made by Timmy's Pies a local London pie producer, who probably sell it for much less at their own market stalls. However, I can only judge it as I find it and despite not tasting bad at this price it was not something I would ever buy again. Unfortunately this means a low score.